Eleven 45RPM singles featuring original label/sleeve art, including an ultra-rare Woodchucks picture sleeve. Housed in a gorgeous, custom-made, magnetic flip-top box, and packaged with a special, LHI 45 adapter to play those pressed middles in style. Part of the sheer joy of Light In The Attic’s excavation of Lee Hazlewood’s back catalogue has been exploring the output of his own, late ‘60s label, Lee Hazlewood Industries, which issued dozens of long forgotten 45s and LPs. Whether acid-folk, country-rock, pop-psych or soul, LHI artists were united by the patronage of the underdog hero of 1960s music, the moustachioed maverick Lee Hazlewood. The best of these have been now collected in You Turned My Head Around, a lavishly packaged, 3000-edition box set of eleven 45s, featuring such LHI favorites as Suzi Jane Hokom, Honey Ltd., Kitchen Cinq, Ann-Margret, and of course the undeniable Mr Lee. To say Lee Hazelwood neither sings nor appears on many of these tracks, You Turned My Head Around tells the listener much about the cult singer-songwriter, producer, film star and latter-day cowboy. Like Hazlewood’s own output, these are pop songs colored by sadness, pain and wisdom. Hazlewood’s character is there in every long, spiral groove thanks to his stunning production. That’s not to say there’s no variety. Artists include the Nico-like Lynn Castle with Last Friday’s Fire, the Zombies-like psych-poppers The Kitchen Cinq, blues-rockers Hamilton Streetcar, the sweet, trippy vocal group Honey LTD, instrumental group The Woodchucks, the Bobbie Gentry-like Ann Margret, psychedelic crooner Danny Michaels and the country stylings of Eve. Then there are those tracks featuring Lee himself: Suzi Jane Hokom proves to be every bit the worthy counterpart to the big man’s sonorous baritone, just as Nancy Sinatra did before, and Hazlewood’s solo ‘Troublemaker’ – a song about a conscientious objector – could be the rebellious performer’s theme song. For fans of the lesser-discovered parts of the ‘60s music cannon, this is a treasure trove, chronicling the rise and fall of the flower power ideal from multiple perspectives; not just that of the young bands looking to ride the groovy train to pop stardom but from the perspective of Lee himself, a man already with a long career behind him, an accidental pop star for whom the hippy movement was to be viewed through eyes with deeper crow’s feet than most. As with all Light In The Attic releases, You Turned My Head Around has been produced with a great eye for detail. Housed in a custom-made, magnetic flip-top box, the package includes an LHI adapter and a free download card for all songs (handy for when you’re away from your beloved turntable). The eleven 7” singles each come in their own picture sleeve, making this a delight to hold, to see and to listen to. Remember the first time you heard Nuggets? Get ready to get that feeling all over again. 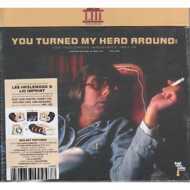 Lee Hazlewood Industries: You Turned My Head Around 1967-70 | 45rpm 7" Box Set | What's Inside?